When the U.S. government finally got around to regulating auto safety in 1967, it insisted that every car have seatbelts and that the steering column be engineered to absorb impact so it wouldn’t spear the driver. The safety rulebook has since swelled to nearly 900 pages and encompasses everything from electronic stability control to rear-view backup cameras. Through all the updates, however, the regulations remain premised on an assumption that may soon be obsolete: that a human would be at the wheel. That’s about to change. U.S. regulators could soon undertake one of the biggest overhauls of the Federal Motor Vehicle Safety Standards ever, one that would apply to cars that drive themselves. Tech and auto companies are pouring billions of dollars into a race to develop self-driving vehicles, which carmakers from Tesla Inc. to Volvo Cars say could be deployed in less than 10 years — assuming the regulations can be put in place that quickly. That’s why automakers have been pressing the agency to get the process underway as soon as possible. While limited road testing is permitted today, mass production of the vehicles will require the new regulations to be in place. Car companies would also like to have some reassurance that what they’re doing is approved by the National Highway Traffic Safety Administration before venturing too far into the unknown. A group of automakers and other groups called the Coalition for Future Mobility issued a statement July 13 urging Congress to direct NHTSA to begin work on writing the driver out of new car designs. Legislation advanced by a House committee weeks later would direct the NHTSA to update its auto safety standards. The bill would also allow automakers to roll out more self-driving vehicles under expanded exemptions from some safety rules while the formal regulations take shape. The bill sends the signal that “NHTSA needs to start planning and take stock of what needs to be done,” said Tim Goodman, an attorney at law firm Babst, Calland, Clements and Zomnir PC in Washington and a former NHTSA attorney. NHTSA didn’t provide a comment. Nearly half of the 73 safety standards on the books now make an explicit or implied reference to a human driver, according to a 2016 study by the Volpe National Transportation Systems Center, a research arm of the U.S. Transportation Department. 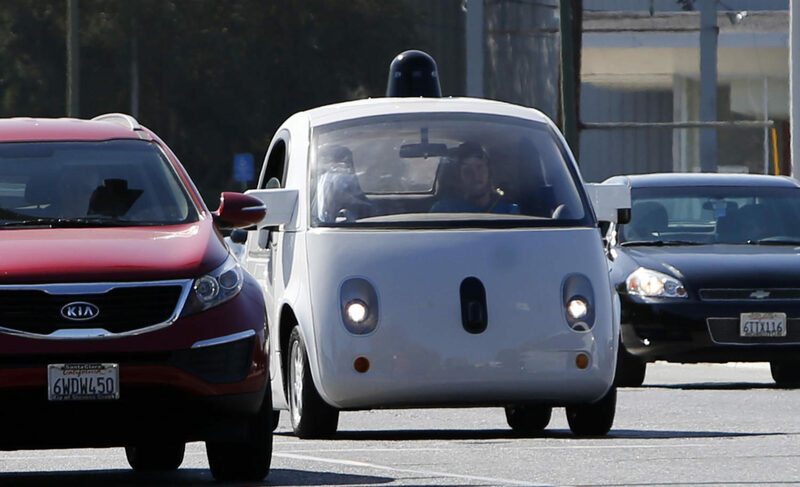 The report found few barriers for autonomous vehicles that stuck to conventional designs. Indeed, Alphabet Inc.’s Waymo LLC self-driving car unit is already offering rides to residents of Phoenix in its fleet of self-driving Chrysler Pacifica minivans, with company testers in the driver seat. Yet the report found more than 30 standards that could present a compliance problem for fully-autonomous vehicles with no human controls or with novel seating arrangements. Moreover, rules governing vehicle testing will have to be modified. A 2016 report by the Rand Corp. found that autonomous safety will need to be evaluated based on how the array of sensors and artificial intelligence computers safely responds to the environment surrounding a car. Testing that spans the full range of conditions drivers encounter on the road will be necessary and “extremely challenging and likely to be a significant barrier to deploying” autonomous vehicles without first gaining additional experience, the Rand report said. In addition to technical challenges, the Rand report said that reaching a consensus on new rules will be difficult with so many companies, consumer groups and private citizens who will be affected by autonomous cars. NHTSA recently updated its new car safety ratings to show if a vehicle is equipped with crash prevention systems such as automatic braking. But the performance of those systems is not evaluated, in part because of disagreements about how that should be done, the report said. NHTSA plans to release updated guidance for safe deployment of highly automated vehicles in September. The nonbinding guidance was initially released by the Obama administration last September and was the federal government’s first attempt to provide some basic safety guidelines for autonomous vehicles without prescribing new regulations that could stifle innovation. Safety advocate and former NHTSA Administrator Joan Claybrook agrees that the task will be very complicated. The agency could opt to amend each problematic standard through the notice-and-comment rulemaking process that can take years. It could also amend groups of related standards at once, or craft separate standards for so-called Level 4 and 5 highly automated vehicles that can drive themselves without human intervention of any kind. Claybrook also said the NHTSA lacks the budget and technical staff to craft new rules for autonomous cars in anything less than five years. Goodman and others estimated it could take as long as seven years to a decade to establish safety standards for fully self-driving cars.